WIW -- Angie's Boyfriend Formula! WIW -- Obssessed with Ripped Jeans! So far I have been wearing the bf jeans with more structured button downs and knit tops; but I decided to try to soften the look with this new silk blouse. To be honest I wasn't going to post this because it looked so much like another outfit I posted (only difference was the top and belt). But after Angie's post this morning, I thought I would put this formula up for review. The occasion was my day off on Tuesday -- some socializing with the girls as well as date night. Picture 1 Outfit Details -- Jeans True Religion Missouri wash, silk blouse H&M sale rack, Bar III white base layer cami, Urban Outfitters gold twist belt, Report Marks taupe booties. Picture 2 -- Exactly the same but with Lucky brand flat-ish sandals. They have a bit of a gold sheen, I love them, very comfortable. I wore the flat sandals half of the day, and the booties the other half. I felt the jeans looked better longer with the flat sandals, 5'3" me needed more leg lengthening. ... To the point where the rest of my wardrobe is feeling rejected. 1. They suit my casual lifestyle. 2. The loose, boyfriend cut and 100% cotton fabrication are comfortable in hot weather. Here are an assortment of WIWs over the past several weeks. All featuring True Religion Cameron boyfriend jeans in either a dark or mid-wash. Thanks for looking and curious what your opinions are of this look. This made me realize there is a difference between what is dated and what I'm just tired of. I think fitted tops was a look I wore for a good 10 years, so for me it feels old even though it's not dated. 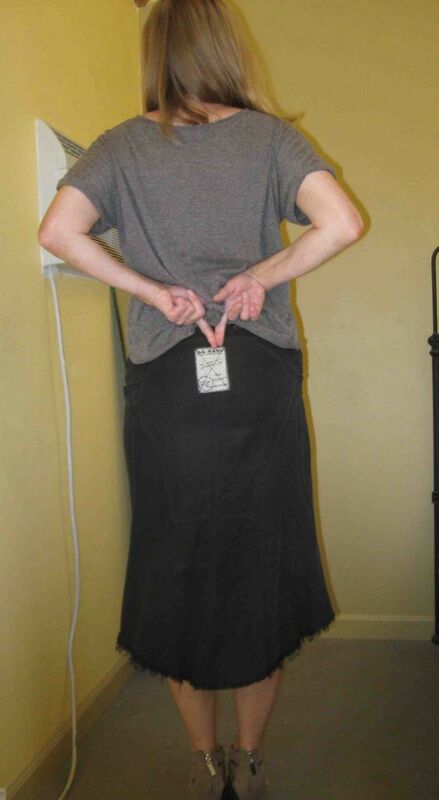 Before Pictures 1/2 -- Da Nang (I was crazy about this brand) hi-lo midi skirt from 2003. I wore this to death until 2006. The back patch and military hardware (#2) are dated I think. After Pictures 3/4/5 -- I am wearing a black cami and black sandals to create a column effect. The loose knit sweater has a hi-low hem, hiding the patch, and is on-trend. Since it was chilly that day I wore my BB Dakota unlined jacket over the outfit. I was told by one acquaintance that I looked like a glamor girl in this outfit. Which isn't what I was going for, but I guess compared to my environmental norm (jeans and sweatshirts), I am. What is dated: The slim fit layering tee is somewhat dated. I think I got it summer 2010. 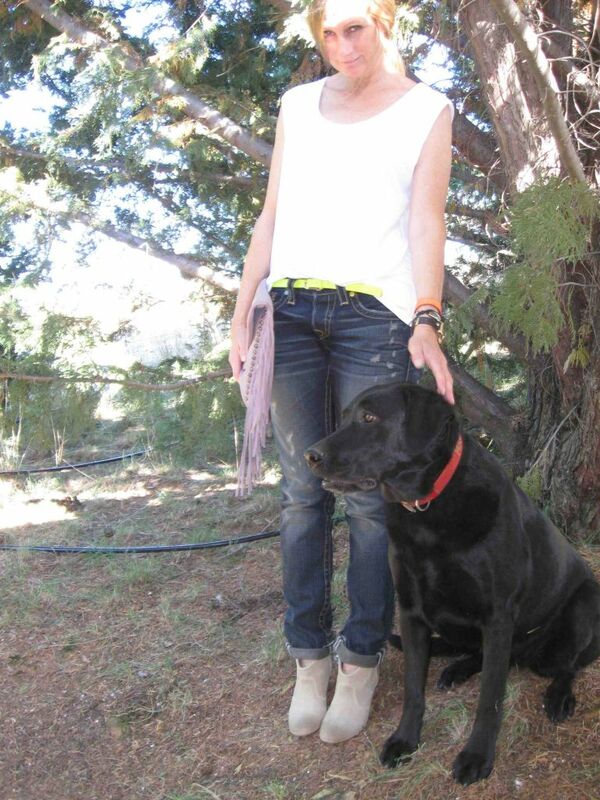 The straight legged jeans aren't exactly dated but they're not the super slim cropped style that is trendy right now. Also a 2010 item. - Grey and neon yellow are an on trend color combo. - Neutral wedge sandals aren't exactly trendy but not dated either (I just got these, they are from DV). Overall the look is more classic than my usual waist-surrendering approach.